Located on the 5th floor in the Life Science Laboratories the Biophysical Characterization facility houses 15 state-of-the-art instruments for the study of structures and interactions of biological macromolecules such as proteins, nucleic acids, lipids, and complexes. This facility supports both discovery-based research and assay development for translational applications. 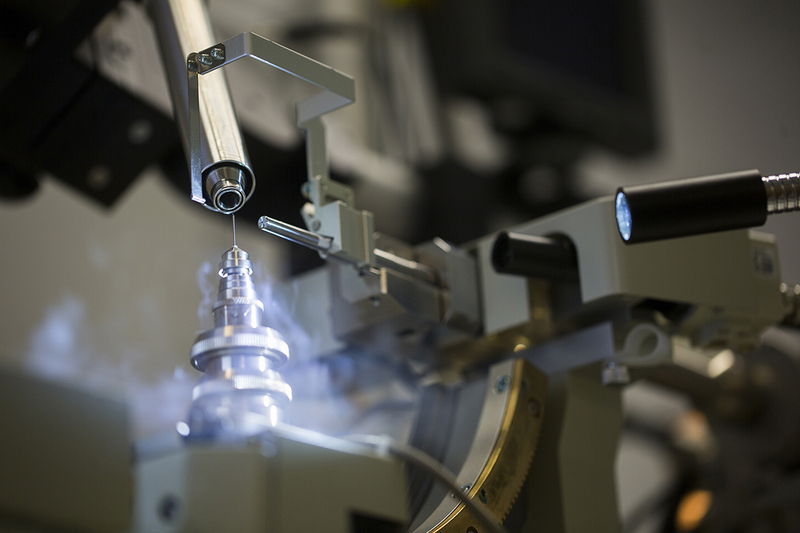 The facility provides expertise and access to the latest, well-maintained instrumentation that is crucial to the research community of the University of Massachusetts system, the Five College system, other academic institutions, and industrial partners. 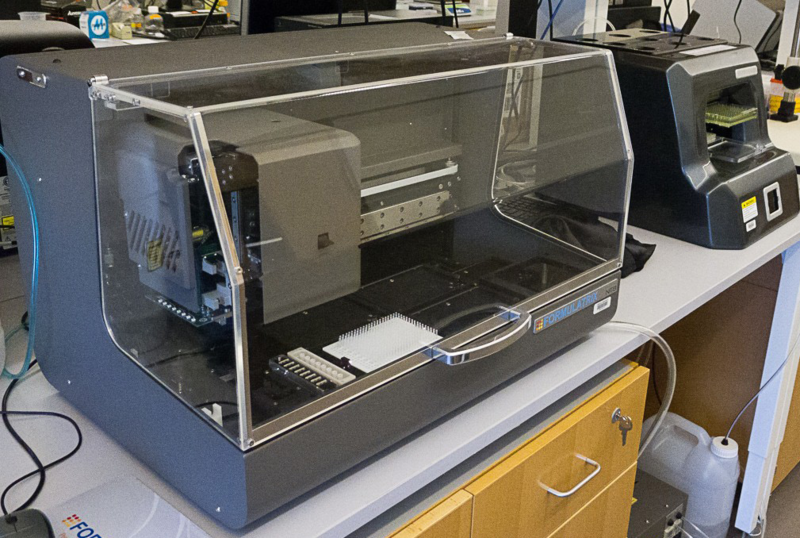 We are able to offer our capabilities to researchers and invite them to use this equipment either on their own or with the help of faculty who have expertise in each method. The lab is also able to accept samples and perform the appropriate analysis for a quoted fee. 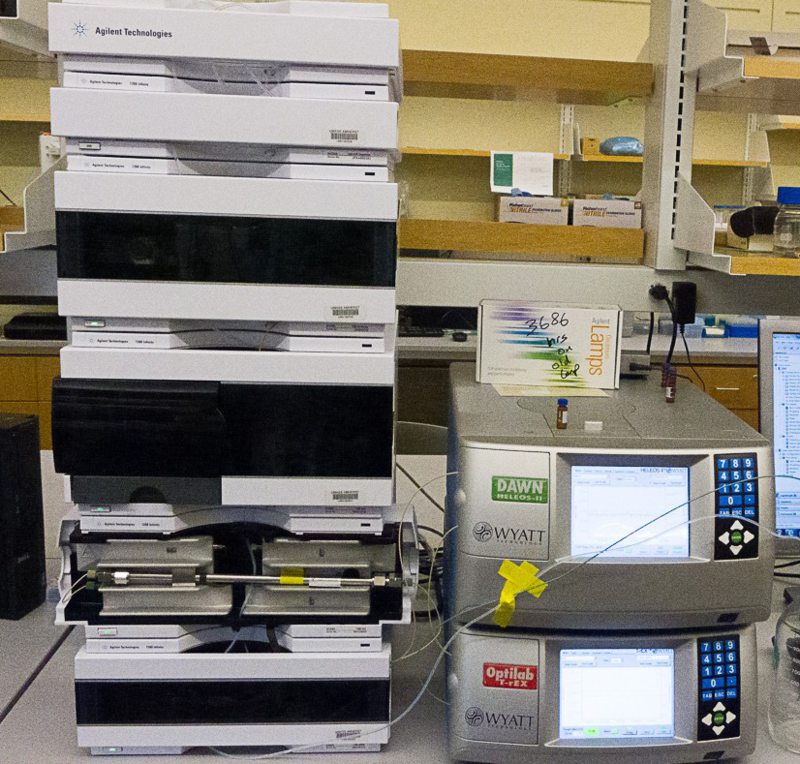 The instrumentation described below was chosen to enable the quantitative characterization of biological macromolecules and their interactions. To request access, training, or more information please contact Lizz Bartlett, facility director. 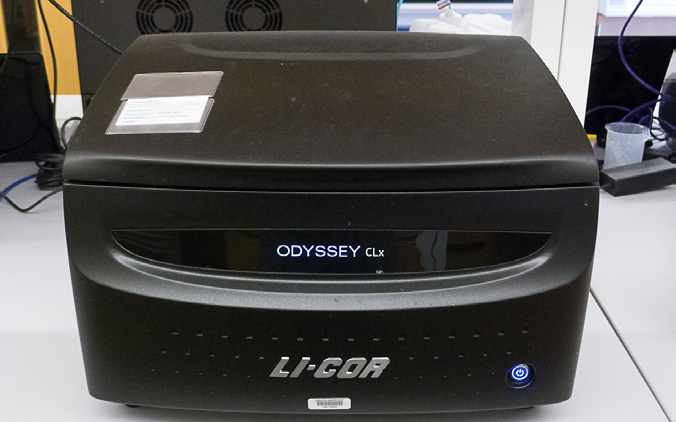 The Odyssey CLx imaging system from LI-COR allows researchers to analyze and quantify up to nine miniblots or six micro-plates in a single scan. Even faint bands can be imaged and analyzed. The resulting images are of publication quality. 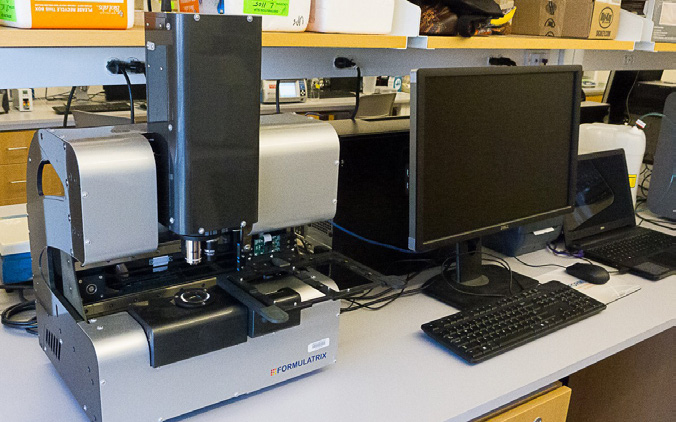 Typhoon FLA 9500 is a variable mode laser scanner with modular access to the optical components, providing both versatile and flexible imaging for precise quantitation of proteins, nucleic acids, and other biomolecules. 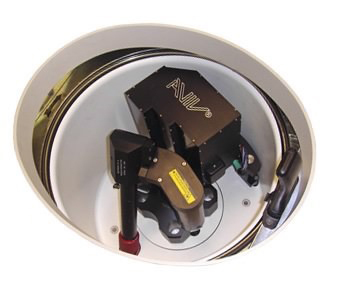 The Rock Imager 2 has both visible and UV imaging capabilities and can be used as a high-powered microscope to manually explore the contents of your plates for crystals. 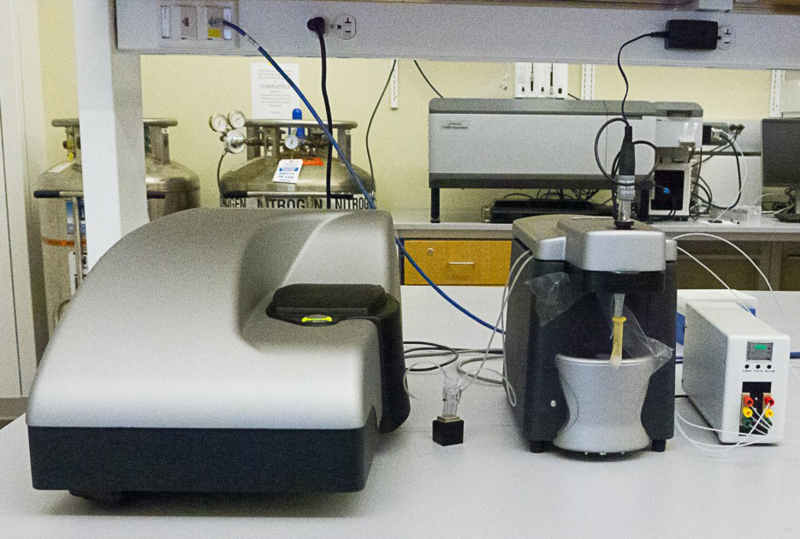 The Analytical Ultracentrifuge Fluorescence Detection System (AU-FDS) accessory for the Beckman XL-A / XL-I instruments compliments the existing detectors. The ProteomeLab XL-I is used for in-solution characterization of proteins, oligomers, aggregates, particles, colloids, and small structures. 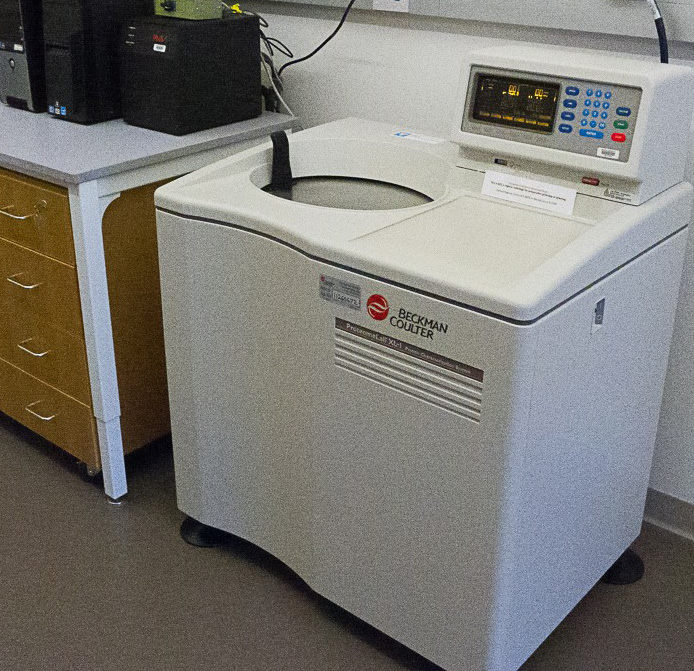 The analytical ultracentrifuge in the facility can be used for several types of experiments, but the two most widely used are sedimentation velocity and sedimentation equilibrium. 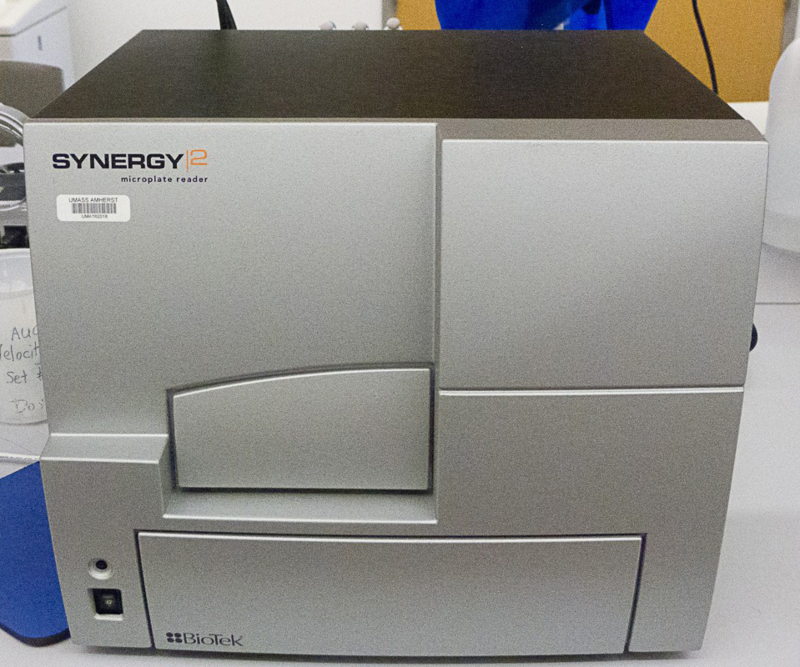 The Synergy 2 is BioTek’s high-performance multi-mode plate reader designed for life science research and drug discovery. Detection modes include Fluorescence Intensity, Fluorescence Polarization, Time-Resolved Fluorescence, AlphaScreen, Luminescence and UV-visible Absorbance. The Formulator 10 is a liquid handling system that is used to generate formulation combinations in 96 well plates for crystallization experiments. The NT8 is a nanoliter-volume liquid handler with drop dispensing capability for adding protein to 96 well plates in crystallization experiments. Using the technique of surface plasmon resonance, the Biacore T-200 measures binding events using ligands immobilized on to a gold chip sensor. Applications include characterizing molecular interactions of small molecules, proteins, antibodies, nucleic acids, lipids and other biomolecules. Circular dichroism (CD) spectroscopy is a powerful technique to probe the secondary and tertiary structures of proteins and peptides. 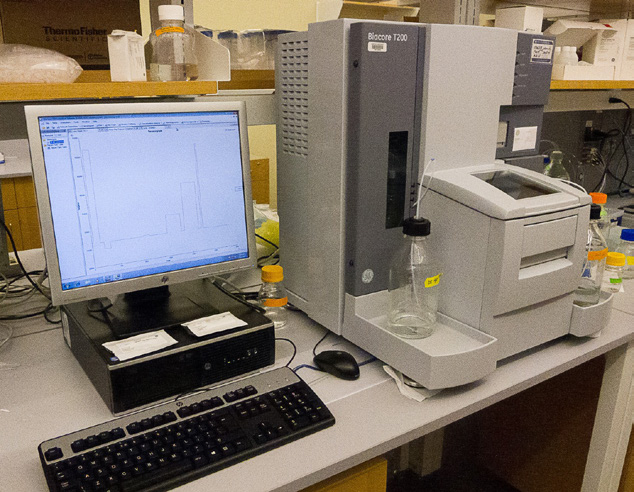 The Jasco J-1500 and the accessories allow researchers to run a wide range of experiments. The Malvern Auto-iTC200 is a fully automated (cleaning steps, titrations, filling cells, equilibrations, etc.) low volume, highly sensitive isothermal titration calorimeter. 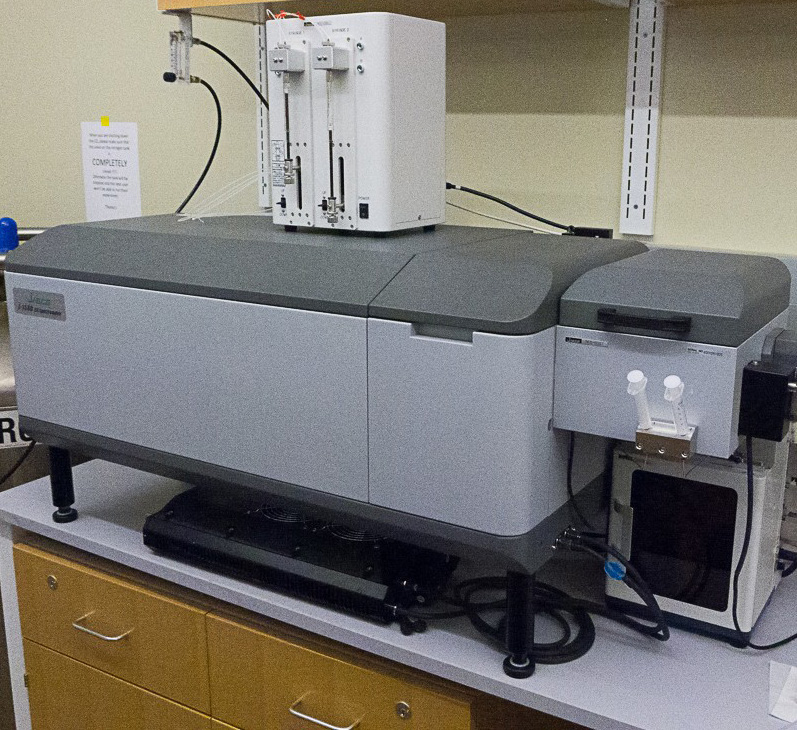 Applications include characterizing molecular interactions of small molecules, proteins, antibodies, nucleic acids, lipids and other biomolecules. 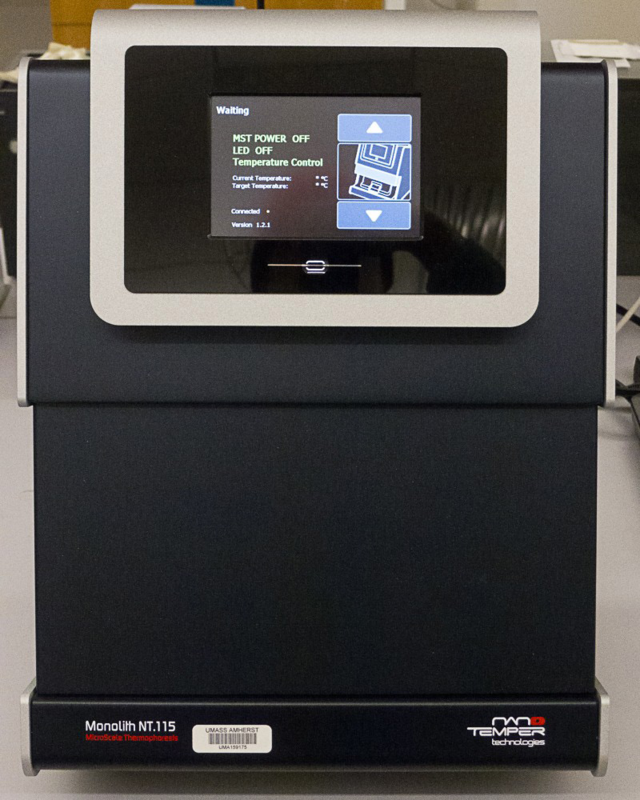 The Zetasizer Nano ZSP incorporates three techniques (dynamic and static light scattering, microelectrophoresis) in a single compact instrument. There is a range of options and accessories so researchers can measure: particle and molecule size distributions, zeta potential, and molecular weights. Microscale Thermophoresis (MST) is a powerful method to quantify biomolecular interactions. It measures the motion of molecules along microscopic temperature gradients and detects changes in their hydration shell, charge or size and translates this into a measure of binding affinity. Size Exclusion Chromatography-Multi-Angle Light Scattering (SEC-MALS) measures molar mass directly, independent of elution time. As an absolute technique, SEC-MALS is used to characterize such attributes as the aggregation state of proteins and the stoichiometry of complexes. The Facility is staffed from 8:00AM until ~5PM on weekdays. Once trained, all registered users may request after-hours access. No one may gain access to the Facility using an ID not their own or use instruments for which they are not trained. All users must receive proper training before being permitted access to the Facility. Training is provided by the core director. The use of instruments or training, by the UMass-Amherst community, requires an advance reservation using Facility Online Manager (FOM). If you do not have an account, please log in here: https://fom.pse.umass.edu/fom/ to create one. You will be expected to make reservations and logon to instruments using your FOM account. Once you have reserved instrument time, please make every effort to be there and use it. If the Facility is not notified or the reservation canceled, you may be billed for any time you reserve. If you have made a reservation and wish to cancel it, please do so using FOM as soon as you can. This is only fair to all who use the Facility. We may bill no-shows and late cancellations, at our discretion. Instruments are used (and billed) on an hourly or daily basis. For instrument usage totaling less than an hour during a day, we charge for a full hour. For usage totaling more than an hour, we charge for the actual time used. The daily rate assumes an 8-hour period. The usage patterns of the SEC-MALS, Biacore T200, ProteomeLab XL-I, and MicroCal AutoiTC200 preclude hourly rates for these instruments; the unit rates for these instruments are half day (4 hours) or full day (8 hours) of use. Users are expected to keep the equipment and equipment areas safe, tidy, and very clean. Repeated failure to maintain this policy may result in loss of use privileges. Until an offsite server is established, users are encouraged to remove their data from the hard disk of the computer immediately after each session. Long term storage of data on the equipment computer is not recommended as the data can be inadvertently removed or overwritten without any warning. To request access, training, or more information please contact facility director Lizz Bartlett at dbartlett@umass.edu. 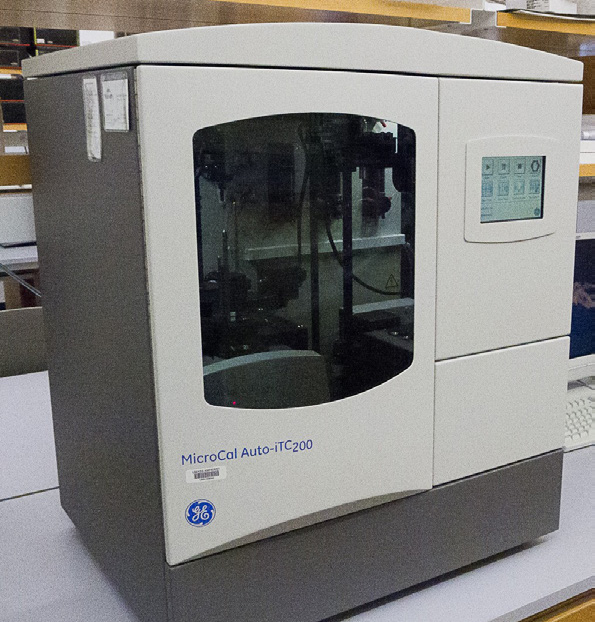 Make a payment to the Biophysical Characterization Facility.